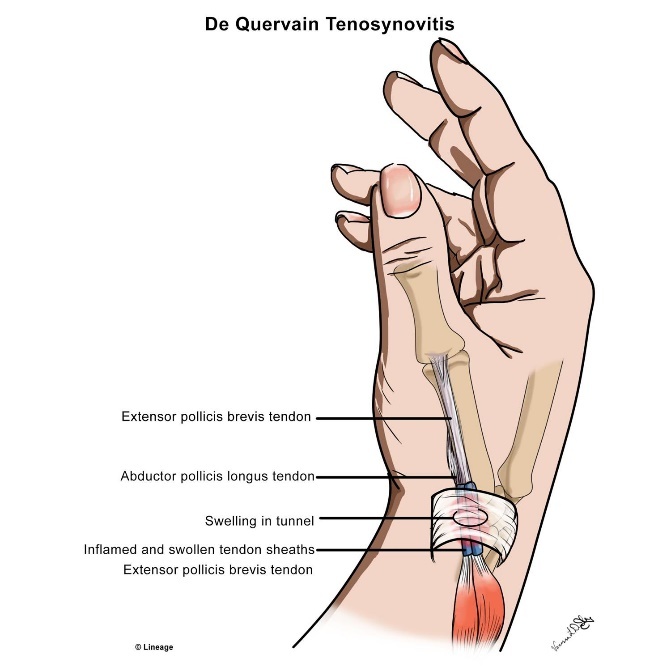 Tendonitis along the inside portion of the wrist was first described by De Quervain, a European surgeon. Unlike the tendons on the bottom of the wrist, the tendons in this area are enclosed in a tight sheath—predisposing this area to difficulty. The tendons on the top of the hand are contained within strong fibrous sheaths which are termed compartments. These sheaths resembled electrical conduits and contain the tendons within their boundary. The sheath are numbered from the inside portion of the wrist to the outside portion of the wrist. There are a total of six compartments. The first compartment contains the tendons for the abductor pollicis longus and the abductor pollicis brevis. Typically there are multiple slips to the abductor pollicis longus. Often there is a separate fibrous sub sheath which houses the abductor pollicis brevis. Patients with this variation may have an increased risk of developing De Quervain’s tendonitis. De Quervain’s tendinosis may be caused by overuse. It also is associated with pregnancy and rheumatoid disease. It is most common in middle-aged women. After your surgeon has taken a history, the next step is a physical examination. The range of motion of the fingers and thumb are checked, along with the wrist. Tenderness to palpation over the first dorsal compartment must be differentiated from wrist pain—typically over the anatomic snuff box (scaphoid). All treatment for this condition is centered on relieving the pressure in the first dorsal compartment which is causing pain. 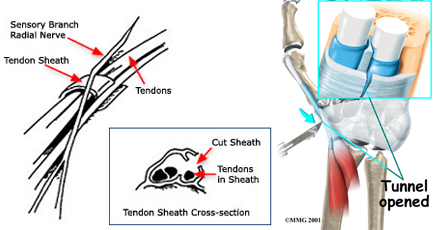 Decreasing the swelling of the tendon sheath (tenosynovium) may be addressed by several entities. Traditionally, bracing was utilized to decrease use of the area. However, studies have questioned the efficacy of bracing and now many surgeons do not utilize bracing. Similarly, although oral anti-inflammatory medication (Motrin, Aleve) have theoretical good utilizations—they are seldom effective except in mild cases. If the symptoms persist in spite of nonoperative management, surgery may be indicated this surgery may be performed as an outpatient basis and typically utilizes local anesthetic. The incision is minimal and the approach releases the first dorsal compartment, allowing the tendons to have unfettered access through this area. After surgery a light dressing is applied and activity permitted. No splinting is needed and a dressing change to a band aid is typically done in 3 days. There is some discomfort after surgery, but this typically abates over the first week. Sutures are removed in two weeks and heavy activity as tolerated. Exercise can be performed at home without the need for a therapist. 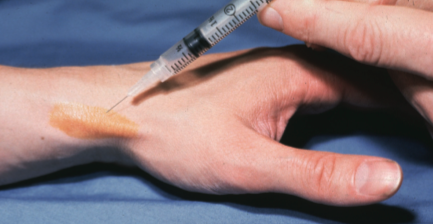 Most patients can expect full recovery with small surgical risks associated with the procedure.